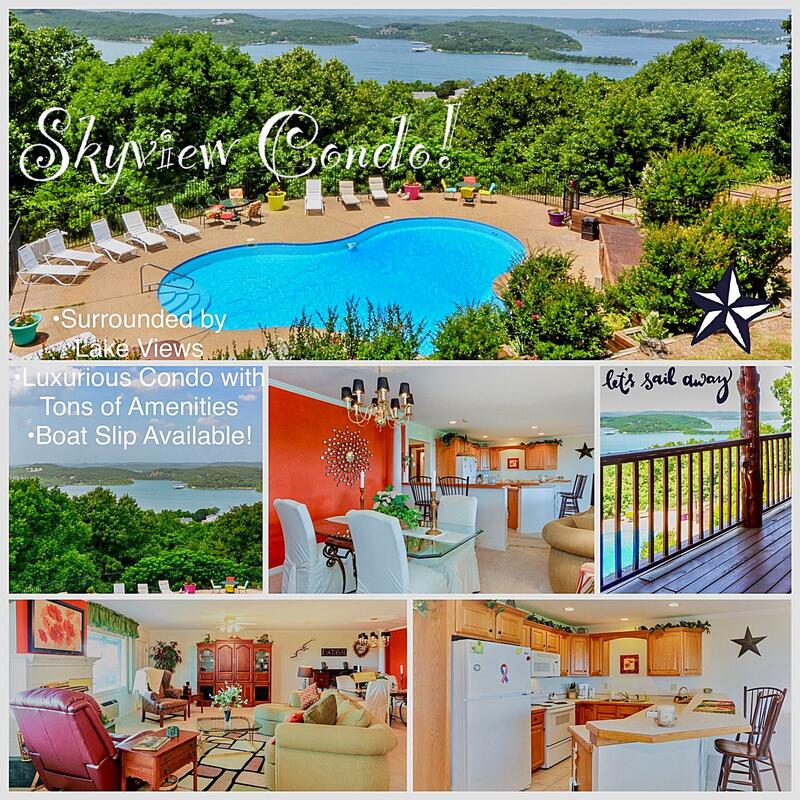 The Skyview condo complex is just moments away from both Table Rock Lake and Lake Taneycomo, as well as nearby Branson. With the lakeside location, owners can enjoy gorgeous views and all the activities lakefront living provides. The condos for sale in Branson West, MO’s Skyview development are large, and some come furnished and move-in ready, making them perfect for either a vacation home or a permanent residence. Community amenities include a pool, hot tub, a clubhouse/community center, and a well-equipped fitness center. If you are a boating enthusiast, you can acquire a slip in the nearby community dock. Skyview condos are located in Branson West, a lovely community that offers a small town feel with big city amenities. This city is near one of the most well-known theme parks: Silver Dollar City. Here, you’ll find tons of live entertainment, thrilling rides and so much more. The nearby Talking Rocks Cavern and Table Rock Lake offer wonderful recreation opportunities such as boating, swimming, fishing, and gorgeous views. Branson West is also very family friendly, with a top-notch school system and medical facilities. There are plenty of shopping and dining opportunities as well. The area is also experiencing a high rate of growth, making it a perfect area for purchasing real estate. Along with Skyview condos, Branson West real estate offers a range of opportunities. You can find everything from mansions, stunning family homes, and condos that are perfect as an investment opportunity. Choose Sunset Realty Services for Your Branson West Real Estate! Whether you are looking for a Skyview condo or another type of Branson West real estate, the team at Sunset Realty Services can help. We consider ourselves to be a little different that the rest of the real estate crowd. We want to treat our clients like family, rather than just another sale. We employ core values that are built around family trust so that everyone benefits when we work together. Please understand that while we may treat you like family, we are very good at what we do. Our team has years of experience in all areas of real estate—from buying to selling. One of our main goals is to ensure you receive the best possible service throughout your real estate transaction. Whether you want to purchase one of these homes for sale in Branson West, MO as a permanent residence or as an investment property, we are here to help. We are even very experienced in helping those with an interest in any property transaction; whether you want to buy or sell, trust Sunset Realty Services to get you the best price!